According to recent media reports, the Islamic Republic is once again preparing to execute Sakineh Ashtiani. b) secure the immediate and unconditional freedom of Sakineh Ashtiani and her lawyer, Houtan Kian. I specifically request direct economic sanctions against the leaders of the Islamic Republic of Iran regime. They are are all – from the executives, lawmakers, judiciary, to the IRGC and beyond – criminals and murderers. They should be dealt with as such. It has come to my attention that the Islamic Republic once again is threatening to execute Sakineh Ashtiani. If the Islamic Republic executes Sakineh Ashtiani, I urge the French government to close the doors to the Embassy of the Islamic Republic of Iran in France. The honorable people of France, and in particular the women of France, have shown their broad and consistent support for Sakineh Ashtiani and her family; Carla Bruni Sarkozy has publicly advocated in Sakineh’s defense, and drawn a slanderous response from the Islamic regime for doing so; and France’s President Sarkozy has taken it as his personal duty to defend Sakineh Ashtiani. France should take the international lead in closing the regime’s embassy in Paris. It is the only appropriate diplomatic response to the Islamic Republic regime’s ongoing perpetration of human rights atrocities. If Sakineh is executed, the UN will be held responsible for its refusal to act or even issue a strong statement against the execution of Sakineh Ashtiani. 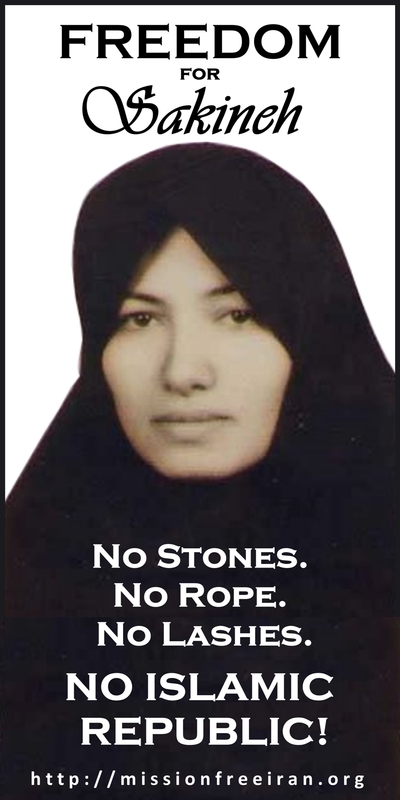 5) If the Islamic Republic executes Sakineh Ashtiani, regardless of how they implement the murder (stoning or hanging), people living near offices and embassies of the Islamic Republic should immediately deposit a pile of stones (painted red if possible) in front of the door or gate to the regime’s office or embassy. If feasible, tape photos and/or posters of Sakineh to the doors, windows, gates, etc. We and all humanity thank you for your urgent action in this matter. Please don,t execute Sakine Mohammadi or anybody who loves to life.Ithink the Iranian rejim has an auto or reson opposite of U.S.A,about sanction or war or somthing els,They have always.